A new month means a new special shake! This April, we’re indulging our guests’ taste buds with a shake that has a whopping great taste: The Double Malt Whopper Shake! 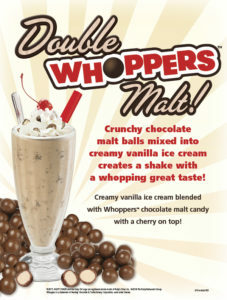 This shake is made by mixing crunchy Whoppers® chocolate malt candy with our creamy vanilla ice cream. It’s topped with whipped cream, a sprinkle of chopped Whoppers® candy, and a cherry on top! Our shakes are sweet as candy, but our April Shake of the Month is one double malt treat that can’t be beat! The Double Malt Whopper Shake will be available from April 1, 2018 – April 30, 2018 at participating locations. Please give your local Ruby’s Diner a call to see if The Double Malt Whopper Shake is available near you! The Shake of the Month limited time offer excludes casino, airport, sporting venue & food court locations. To see a list of all of Ruby’s Diner locations, please click here.